I have to admit that it was rather striking and funny when spoken by Sir Walter to his daughter in the movie. This is just one example of the way in which the media can either add to or subtract from the original work of an author. Adapting a story for a screenplay is tricky business. The writer has many decisions to make and some sacrifices, too. Time allows only so much, and it is inevitable that we the viewers will want more, usually no less than the complete book! On the one hand it is exciting, for us the viewers, to experience one of our favorite books coming to life, to see the places Jane Austen wrote of and hear the wonderful dialog, and to marvel over her genius once more. On the other hand, it can sometimes be discouraging when we see our favorite book seemingly ruined by the misconceptions of writers, directors, or actors. The world of media is fickle, so many opinions and decisions bear upon the outcome of a movie. 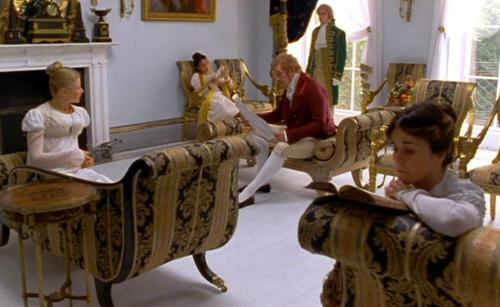 In this section we will take a look at the movie adaptions and evaluate each as they compare with Jane Austen's books, the time period, and on their own merits.